Every brand wants to be in every customer’s pocket. I came across an article recently where it was noted companies were specifically asking their web designers to deliver iPhone/Apple iOS -friendly websites. Executives request iPhone-friendly sites, because it’s likely that they themselves are using iPhones, which is fine. However, requesting something just because it’s in your phone isn’t always the wisest approach. Whatever’s in your pocket isn’t necessarily a platform that’s in your customer’s pocket. 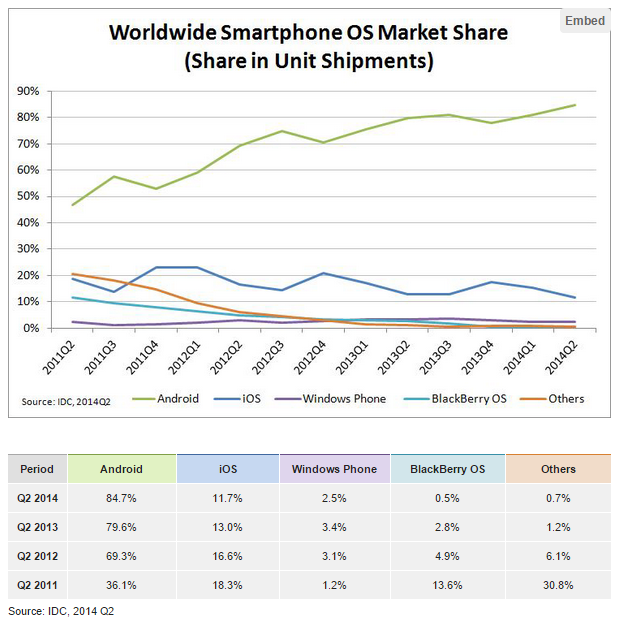 Google’s Android platform has a global market share of 84.7%, compared to iOS’ 11.7%. In the United States, that large gap narrows, but Android still leads Apple 52.1% to 41.9%. Even in 2010, when the content development article I’m referencing was written, iOS had only 24.4% of the market, with 41.7% belonging to market leader RIM– yes, Blackberry. Content developers, project managers, and strategy leads would always do best by their stakeholders to create websites that perform well on their particular smartphone platform. However, in this advanced mobile era, every strategist must keep these comScore numbers in their hip pocket, and develop content that works well on the most popular platforms- regardless of what sort of phone senior management keeps in their pockets. That is the best way to be truly mobile and customer centric. In this era of content delivery, it’s all about delivering an experience the customer wants, on their terms. This entry was posted in Business, Marketing and tagged Advertising, Audience Centric, Branding, Brands, Customer Centric, Digital Marketing, Integrated Marketing, Marketing, Mobile Marketing. Bookmark the permalink. Great post, Joe! You raise a great point about the importance of developing for the user experience, independent of your own. I remember when I worked in the communications office of a private school — we definitely had to keep up with the tech savvy parents, while trying to provide information for those who may have lagged behind. It’s a challenge to design for the future while trying to maintain the present, but with the right tools and a proactive strategy, it can be done. Great post. You couldn’t be more on target than you were when you stated, “it’s all about delivering an experience the customer wants, on their terms.” The different, ever changing mobile devices certainly provide a challenge for today’s marketers. I currently work in an industry where some of our audience has really adapted to the new mobile technologies and others who don’t see the value in social media or even smart phones. This provides a big challenge for us but also emphasizes the importance of delivering a comprehensive, integrated marketing strategy.